I sent the e-mail off to join the 52 Pair Plunge. Yep, 52 pairs of socks in 52 weeks. Yep. A lot of socks. Yep. 5. Charity knitting - The Haven could use some, I am sure. 6. Goodness knows what I'll do with the rest. A pair a week sounds easy, until I really looked at the patterns I wanted to knit (read: All Cookie A's designs), what I already have on my needles (technically not a lot) and all the other things I may want to knit (Fiery bolero, the big frill, etc.). It may be that I have "plunged" into too big of a project. When you think about the sheer number of stitches it takes to knit 52 pairs of socks. Yeeeeek. Still, I have enthusiasm for this project. Socks are fun for me in the summer because they are easy to tote around. Plus if I am doing baby and kids socks the count should add up quickly. Not even a mention or thought about the skeins (and skeins) of yummy sock yarn I will be using has crossed my mind. The colors, the fibers, the . . . money?! Oh well, we only live once. So here I go! BTW ~ if anyone could help with saving the buttons (52 Pair Plunge and the Debbie Bliss KAL) to my side bar, I would really appreciate the help. Update - Yea it works! Thanks eKNITabeth! After a few torturous moments, OK, hours really, the Simple Wrapover by Debbie Bliss is finished. This project has been with me since December. We have become the best of friends and the worst of enemies. After a complete grounding and two month sentence to the UFO basket to think about its naughty ways, we regrouped and completed the task. Yet, I love the sweater. Not factoring in all the stretch that occurs with Alpaca, I should have knitted the next size down, but the additional fabric let's me wrap it a little tighter. It's cozy and very, very comfortable. For all the lost mojo during knitting, I think will gain mojo during wearing. You can see pattern details, etc. here. I am so done with this sweater. There are a few projects that you just don't have the mojo on. They draw you in, so innocently with superb pictures, lighting and one of the "beautiful people" as models. The yarn is ultra soft and contains all the luxury fiber you could want. 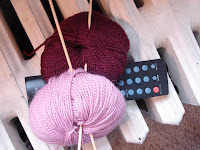 Then, you start knitting (here is where the wheels fall off). You knit, and knit, and knit and knit. Find out you misread the pattern and you rip and rip and rip back to stupid, idiotic, moronic said error and fix. Beginning again, you then knit and knit and knit. Rinse, wash and repeat the last two steps twice more. Still nothing seems to be going right. If you are like me, you then give the piece a good, strong talking to (while including all kinds of four letter explicative’s) and send it to the UFO basket for a long over due time-out. I have always hoped that during this imposed time-out the magic will some how re-appear, bringing the joy back to knitting. Normally it does return. Yet this time I had to yank the magic back by-the-horns so to speak. 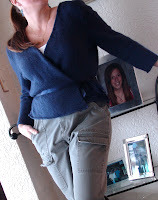 Because I worked so hard on this sweater, you are getting three pictures! That and it is so damn hard to photograph this color blue. Not one picture showed all the details. It has a great picot edging. The drape of the fabric is wonderful and seems to float on you. But none of this showed in the photos. Again, no magic or mojo for me. I am so done with this sweater. PS ~ please know that this in no way is a reflection on the designer. This was a total reflection on me as screw-up knitter. 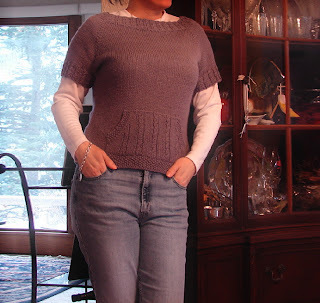 I will knit Debbie Bliss patterns again and again. Soccerchica wants the Fiery Bolero by Debbie Bliss from IK Summer, 2005 issue. 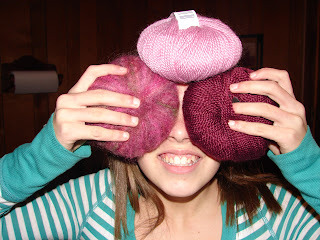 But for a teenager that abuses clothing, I could not see spending $40 for yarn. So I have been in search of a dk weight cotton blend, in brown no less, for a few weeks. Still searching, so if you have any thoughts, please let me know. Because of her request, I decided to drive over to Marshall and visit a LYS there. This shop has beautiful cotton blends that I will need to try in the future. But nothing in my price range for the bolero porject. Because I had money burning a hole in my pocket, I scored some Sublime Yarn in the Merino DK line and The Sublime Merino Hand Knit book. The yarn will become a pair of fun, striped socks with mismatched toes. I plan to knit them on US 3 or 4 size dpns to get a nice tight fabric. The gauge I am shooting for is 6.5 stitches to 1". The yarn is superbly soft to the touch. The true test being how it knits up. Colors are muted, but full (I want to use the word ripe, but don't think that would convey what I am trying to say) in a wonderful color palette. But I am feeling the call to knit the sweater that is on the cover. 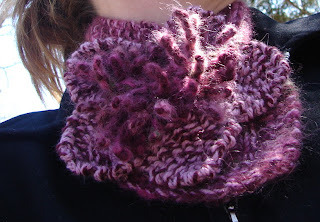 It is called the big frill and you can see it here. I don't normally like stripes on clothing that most people who wander into my life will see (read: shirts, pants, etc). I especially don't like the stripes that wrap around you horizontally and if worn incorrectly, end up making me look like a circus tent. I think that the frilly sweater looks great on "the beautiful people," but will it look good on one of us everyday, "garden variety people?" Also, my usual wardrobe is filled with solids, or pieces with minimal details, very simple clean lines that fit well. So something frilly with stripes is a big leap for me. But I can't stop thinking about it. It sits on my desk, begging me to look at it, dream about it, knit it. There are several other nice designs in this book. I think that Boo-boo would like the little retro sweat. Very stylish with the simple design at the neck. Being that he needs a new sweater for church, this one might just fit the bill. Now, RM would look great in the little rib number. He does not wear sweaters all that much; he’s more of a vest guy. So I don’t know why I am attracted to this sweater. Though it could be that I quite enjoy looking at the man who is modeling this sweater - Oh, admit it, you think he might be a little cute too. Shhhhh, don't tell RM. Overall, the designs in this book are simple and classic. I am growing fond of them. Notes: This was first blogged about here and here. I added a third button as a stabilizer because flower tended to flop. Jo Sharp yarn is so soft against my skin. Before it was washed and blocked, I could take or leave the feel of the yarn. But after . . . oh baby. Here is a close up of the large button that should show through the center of the flower. It was purchased at JoAnn Fabrics and I can not remember the name or brand. JoAnn's had a lot of them in stock. I love this vintage feel and think it compliments the scarf yarn and style beautifully. The designer's thought was to have the button show through as the eye of the flower. Because of all the twists around the button hole, it sometimes doesn't show through as well as I would like it to. Overall, I really like this scarf. All finished ~ just in time for spring. Let's all hope some of those early spring outdoor soccer games are cool. I know it's corny, but it's fun. Enjoy your weekend and be safe. I have known that Grey's Anatomy was around. We have a television. I read the gossip magazines in the grocery checkout, but I had never, ever watched the show. There are other things in my life more important. Children, knitting, husband, knitting, cat, knitting, eating, knitting. . . you get the picture. I would neglect my chores and place the kids in front of the TV to knit (Not, very often, I am not a big TV advocate mind you). Knitting was my escape, my serenity, my calming force so to speak. RM would come home and I would have a new sock done. No clean boxers, no dinner ready nor the house clean, but a great new sock. My knitting friends would come over and all the kids would play while we happily knit. Sure toys were everywhere. Yep, they had noodles from a can and juice (instead of milk) for lunch. But everyone was having fun. Before I had to go searching for a Grey's Anatomy Box Set. You see, it was a gift for CJ, my sister's husband. A smart, intelligent man who has a hidden sense of humor (and a knitting blog lurker . . . I know your out there, I can feel you). Never really understood what he saw in this television show. Up until now, I thought it was another ER. Too much blood and drama for me. If I am going to sit in front of the TV or movies for that matter, I want to enjoy what I am watching. But on a whim I rented it (hey, it was free). Big mistake - BIG mistake. Now I am neglecting my duties for a new love. There is a knit night in my town that I just found out about (helps to read the paper once in a while Trixie) on the same night! Oh no, how do I choose? I can't . . . I won't . . . Help! My mind's made up, tonight I'm cheating on my knitting! Thanks CJ. Well, the weekend weather was gorgeous! We all went outdoors for some fresh air. 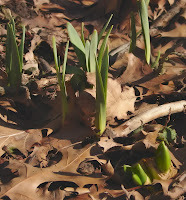 These are some daffodils (I think) that are coming up next to the garage. I planted them two summers ago, along with some hyacinth, early tulips and crocus. When they are all in bloom, they look lovely. RM & Boo-boo spent quite a bit of time down by the lake smashing the ice up. By the time they were done, RM had fallen in to the water up to his knees. Does the little boy ever leave the man? During Friday's game, Soccerchica hurt her wrist after being smashed into the boards (whoever says that girls don't get rough was WRONG). Long story short, she is now wearing a splint, waiting for the results of x-rays. Read fracture and/or cast in our future. Since I am fighting a cold, I am taking vitamin c and zinc to keep the worst symptoms away. Doesn't seem to be working. I just want to crawl into bed and sleep the day away. But, Mom duties call . . . I haven't worked on Flora for a while because I ran out of yarn. 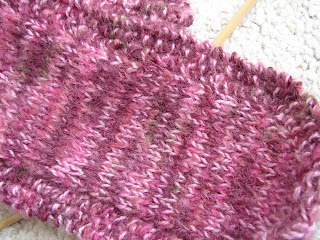 Knitting the body began with Jo Sharp's Kid Mohair in Rosehip and Alpaca Kid Lustre in Ripe and Vintage all held together. Ending this project with the same yarn would be nice. The yarn is very enjoyable to knit with. Colors are ever-changing, with absolutely no pattern/pooling, which is fun. An added bonus is the Alpaca is very soft, especially pleasing since it will be going near the tender skin of my neck (I am a delicate flower, you know). The scarf portion is complete, but I did not have enough yarn for the flower. Because I really wanted the dye lots to match, more was ordered more from Lost Art Yarn, in Traverse City. This was where I purchased the original batch and they (thankfully) had the same dye lot in stock. So after some exchanging of vital purchasing information, the yarn is now here. It came in the mail today! Whoo-hoo! But aliens seem to have taken over our house, so I hope I get to use the yarn at all (really, it's Soccerchica being goofy - gotta love her). Speaking of Soccerchica, there are lots of soccer games this weekend for her. We had two indoor games last night, two games for a Tournament in Wixom today, and another indoor game in Grand Rapids on Sunday. Yep, I'll be doing a lot of driving. But knitting will go with me. At my current rate I should finish this about mid May. It goes without saying that I will have to wear it once before she is put away for the season. I think Flora will look stunning with my Bermudas, t-shirt and a cute pair of strapy sandals - in June. Pray for a chilly morning. . . Remember how much fun it was to be a child? What was it that made us laugh at the simplest things, for no reason at all? Gloom seemed to over take our house, eating our happiness. We were grouchy. Cabin fever had hit us in a bad way. Since Michigan's current climate isn't exactly outdoor swimming weather, we did the next best thing. 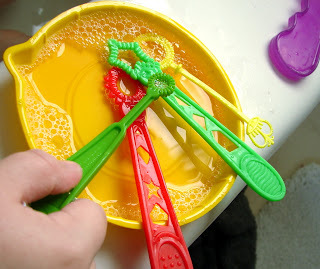 During Boo-boo's bath time, I got out the bubbles. Not the bubble bath kind, but the outside, blow kind. He spent over an hour in the tub. Blowing bubbles and laughing - hard. This brought all the sunshine we needed back into our home, effectively erasing my memory of all the earlier bad and gloom, making me happy. He's now asking for bubbles at every bath time. Sunshine everyday at our house, Yippee! 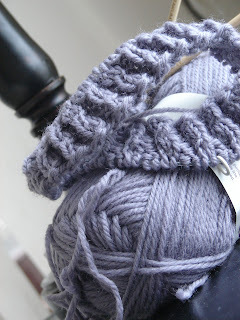 Knitting note ~ sleeves are on the needles for Ouch and I have put Wicked down to contemplate my next move. Last night my cousin arrived for a too short stay and dinner. He has a 30 day leave from the Army. Because his daughters are attend school (in Germany) and he did not want to pull the away from their studies he is doing a week's worth of traveling on his own. I felt compelled to feed him a home cooked meal. Now, cooking is really not my strong point. I made meatloaf once that our dog wouldn't eat it (really, that's true). But I did make a passable meal this time. No vomiting or upset tummies so far. 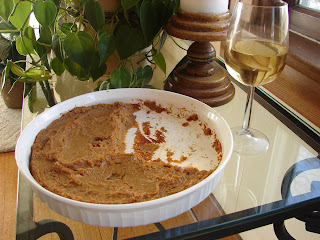 The one dish that did turn out was this Sweet Potato Soufflé (recipe courtesy of JJ). It is Hmmmmm so good. In fact, I had a little this am for breakfast. Very rich and creamy. Here is Wicked a few days ago. Having forgotten that I even took the photo, I found it while downloading food pictures. So I thought, "What the Heck." But I can not get the color right to save my life. Flash on. Flash off. Light in back. Light on side. Heck I even tried no light. But still the color remains washed out. After knitting the body to 10 inches, I am wondering if I should a) do the increases for hips even though it seems ample through the waist already, b) forge ahead without the increases, or c) rip back and decrease once or twice more, then included increases at hips as written. Decisions, decisions. Does anyone have an opinion either way? Well, I waited so long to post this that I think it's safe to head back for some more Sweet Potatoes! A girl can only go so long between meals. Where Oh Where Has This Knitter Gone? Well, I've been knitting away at the Simple Wrapover (aka Ouch)and Wicked. I can see the finish line on Ouch. The back panel has, literally, one more inch to knit and it will be done. After that I can move on to the sleeves. Because I just want to be finished with Ouch, I am going to cast on both sleeves on the same needle. Wish me luck, because with the mojo this sweater has/has not (depending on your outlook), this could be interesting. Wicked is a few inches from getting a pocket. After that, she only needs the left sleeve (I finished the right sleeve because round after round of Stockinette was, well, tedious) and . . . viola! . . . a new sweater. Yet, I can't help to second guess my yarn color choice. It could look brilliant or look like the Easter Bunny threw-up. It was sunny this morning, yet I missed my opportunity to get a photo with true color of the yarn for you. We won't know until it's all done, eh? My cousin is coming to visit tomorrow evening. He just returned from Iraq, where he earned a Bronze Star during this last tour (he has been to Iraq more than once). So, I am cleaning and getting ready to cook him a great big "comfort food" meal. We are very excited to reunite with him. He has asked me if I would ride to Clinton Township with him to visit some family grave sites later this week. So I may get a chance to spend more time with him, we'll see. Maybe I could get him to stop at a yarn shop or two along the way? Yea, riiiight. Check these wonderful socks out! Cookie has done it again. These patterns were for sale at Stitches West. For obvious reasons, they sold out. Let's keep our fingers crossed that we will be able to buy them via internet soon. I've decided I am going to hold my breath until the patterns are available. My finger is poised on the "buy" button for paypal, ready to purchase when they do go on sale. She better hurry . . . I'm getting light-headed due to lack of air . . .